In 2006, five years after the horror of September 11, 2001, a diverse and eclectic group of bloggers created the 2,996 Project. In this project, one blogger was assigned to prepare a remembrance for each of the victims who died during the terrorist attacks. It's hard to believe eleven years has passed since this horrific tragedy. Last year, on the tenth anniversary, there were many television specials, newspaper stories and articles to commemorate the event. It seems to me that this year the quiet lives of the victims are fading into the mist of time. That is the greatest tragedy of all. Please take time to remember just how frail and how fleeting life really is. Read and remember Peter Hanson, Sue Kim Hanson and their little daughter Christine Hanson, the youngest victim of 9/11. 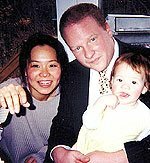 Susan Kim Hanson, her husband Peter and their daughter Christine were just three of the victims of the September 11, 2001 terrorist attack that took the lives of 2,996 souls in the World Trade Center, the Pentagon and the fields of Pennsylvania. Sue, Peter and Christine were on United Airlines Flight 175, flying to Los Angeles to visit Sue's family and to take their daughter to Disneyland. However, people whose hearts were filled with hate hijacked their plane and crashed it into the South Tower of the World Trade Center. 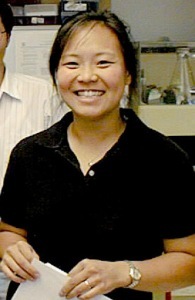 Sue Kim Hanson was a great scientist in the making. She was a doctoral candidate in micro-biology immunology at Boston University and working on her final thesis. Her work promised to reveal the workings of a chemical believed to regulate immune responses. She had isolated in lab mice a gene suspected of being involved in asthma sufferers and AIDS patients. Her work had the potential to help millions of people. That she would be attracted to the wild and undisciplined Peter Hanson was a great surprise. Three years younger than Sue Kim, Peter gained his education by following The Grateful Dead. Peter believed that the group and its music would become classics, up there with Beethoven, Bach and company, and he tried to sway the opinion of anyone who would listen. Taking a last break before finalizing her research and thesis, they boarded United Airlines Flight 175 for a mini vacation. Peter Hanson is remembered as one of the passengers who documented the hijacking during the flight with two calls to his father. Peter made a final cell phone call to his parents moments before the plane crashed into the south tower. "It's getting bad, Dad. A stewardess was stabbed. They seem to have knives and Mace. They said they have a bomb. Passengers are throwing up and getting sick. The plane is making jerky movements. I don't think the pilot is flying the plane. I think we are going down. I think they intend to go to Chicago or someplace and fly into a building. Don't worry, Dad. If it happens, it'll be very fast. My God, my God." The call ended abruptly. Those memories will haunt us forever. But there are better memories, too. "Eight children were murdered on hijacked airliners that crashed on Sept. 11. Christine Hanson, 3, was on United Airlines Flight 175 with her parents. She was on her first trip to Disneyland. Christine was brown-eyed and rosy-cheeked and button-nosed. At family meals, she made everyone stand and hold hands while singing the theme song from Barney. During Christine's funeral, mourners re-enacted the scene, singing: "I love you, you love me""
God bless you Christine... and Peter and Sue and all those who died so tragically five years ago. If my Tribute to The Hansons here today fell short in any way, I deeply apologize and would love to hear from any of you. Back in 2006, the 2,996 Project asked bloggers to prepare tributes to all who died in the tragic events of September 11th. Many of those blog entries remain on line and many will be reprinted again this year. Peter and his family are greatly missed by his SAS family. My heart goes out to the family. Tonight I'll light a candle in honor of his family and all those we lost on 9/11. Peace be with you all. I don't think it fell short in any way. It's a beautiful obituary to a whole family who died. You Must Read "We Must"